The Swingin' Axes and Swingin' Aces at Stephen F. Austin State University will perform "Something For Everyone" at 7:30 p.m. Friday, Oct. 12, in W.M. Turner Auditorium on the SFA campus. NACOGDOCHES, Texas - The Swingin' Axes and Swingin' Aces at Stephen F. Austin State University have "Something For Everyone" in store when the jazz bands perform at 7:30 p.m. Friday, Oct. 12, in W.M. Turner Auditorium on the SFA campus. In the bands' first concert of the fall semester, Axes Director Dr. Deb Scott and Aces Director Dr. J.D. Salas have planned a varied program that ranges from traditional swing to Latin tunes to old jazz standards and guarantees the concert theme: "Something For Everyone." The Swingin' Axes will perform "Corner Pocket" by Freddie Green. "This is a traditional swing chart made famous by the Count Basie Big Band in 1955 and then recorded again by Harry James in 1976," Scott said. The Axes will also perform "Machito" by Pete Rugolo, which was recorded on Stan Kenton's album "Cuban Fire" in 1947 and honored an influential musician from Cuba, Machito, who performed with the Kenton band, Scott explained. Also on the Axes' program are several Gordon Goodwin selections, including "Backrow Politics" featuring the trumpet section, "Horn of Puente" and "The Check's in the Mail," along with "Show Up" by Michael Davis and Cole Davis, a modern funk tune recorded recently by the Hip-Bone Big Band. "Special guest joining us to play on the two Latin tunes is Paco Morales, our own SFA piano tuner," Scott said. A number of old favorites are on the Aces' part of the program, including Sammy Nestico's arrangement of "Satin Doll" by Duke Ellington and Billy Strayhorn; "Love for Sale" by Cole Porter; "There Is No Greater Love" by Isham Jones and Marty Stymes; and a great arrangement of "Softly, As In Morning Sunrise" arranged by Dave Rivello. Concert tickets are $8 for adults, $6 for seniors and $3 for students and youth. 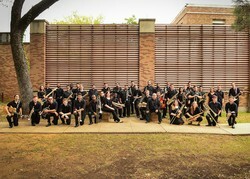 For tickets or more information, call the SFA Fine Arts Box Office at (936) 468-6407 or visit http://www.finearts.sfasu.edu/.